Leonardo da Vinci (15 April 1452 - 2 May 1519) was one of the great creative minds of the Italian Renaissance, hugely influential as an artist and sculptor but also immensely talented as an engineer, scientist and inventor. As few as fifteen of his paintings have survived, but together with the thousands of surviving pages of his notebooks they reveal the most eclectic and brilliant of minds. 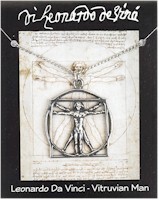 This Vitruvian Man model is made from pewter and is supplied on a silver chain. The information card gives a brief outline of Da Vinci's life as an artist. Pewter Emperor's gem ring supplied in a clear blister on an information card which explains about Roman jewellery and also about the games at the amphitheatre. Pewter 'stone' with the symbol for success engraved on it and supplied on a waxed cord. The information on the reverse of the card explains about the Viking alphabet and what each runic symbol means.